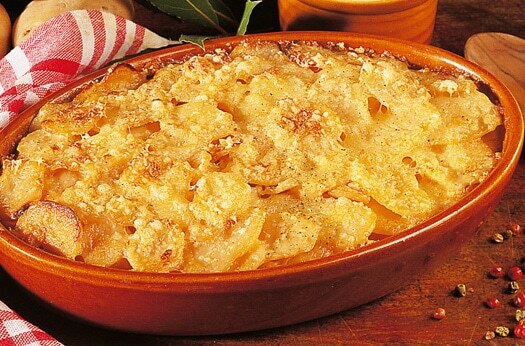 Gratin Dauphinois is a popular French recipe of cheese and sliced potatoes right from the French Alps. Although there are several versions of Gratin Dauphinois there are three key essentials, equally sliced non-mealy potatoes, garlic coating on the pan and the correct size casserole for the Oven temperature. The dish is normally seasoned with nutmeg in addition to salt and pepper. People have come up with variations that include grated Parmesan or Gruyère, anchovies, dried porcini or even eggs. Gratin Dauphinois has its origins in Dauphine district of south east France and has also got its name from there. This is mostly a mountainous region well known for skiing with Grenoble as the biggest city. Emmental or Swiss cheese is produced here which is commonly used in this French recipe. As carbon dioxide gas is left during the processing you can see bubbles in this kind of cheese. Preparation Time: 45 min Cooking time: 1 hour Ingredients Potatoes – 2lb (waxy potatoes such as pink fir apple, russet) Cloves garlic – 1 or 2, mashed Butter – 2 oz Whole milk – 2 cups Swiss or French Gruyère cheese – 5 oz Double cream – 1 pint Salt, pepper and nutmeg- to taste Method of Preparation Serves- 6 1: Preheat the oven to 360ºF. Cut the potatoes into 1/8 inch thick slices and wash in cold water. Remove and dry with a towel 2: Place the potato slices in a wide pan and pour milk. Sprinkle salt 3: Bring this to a boil on medium heat for about 5 minutes and on low flame for 10 minutes. Mix it from time to time. 4: Take a fireproof dish and rub it with garlic and oil well with the butter. Place half the potatoes mix into the gratin dish. Sprinkle half the cheese, pepper and double cream on this layer. Place the left over potatoes and envelop it with the remaining double cream and cheese. 5: Set it in the oven and let it cook for about an hour at 360ºF. Your Gratin Dauphinois is ready to serve when the top is brown and gold. Enjoy the French recipe with Beaujolais Villages or Red Bordeaux wine! Bon appétit!